It has been a long tradition: Berkshire Hathaway HomeServices Rubina Real Estate has been awarded the prestigious International Property Awards once again. The Berlin-based real estate company was named winner in the categories Property Consultancy and Real Estate Agency for Germany. Additionally, Rubina received the 5-Stars Award in both categories. The awards are aimed at real estate companies and are a globally recognised seal of quality reserved for the absolute industry leaders. The jury is made up of acclaimed experts, including The Earl of Liverpool, Lord Caithness and Lord Best, who decide on the award of the prizes. 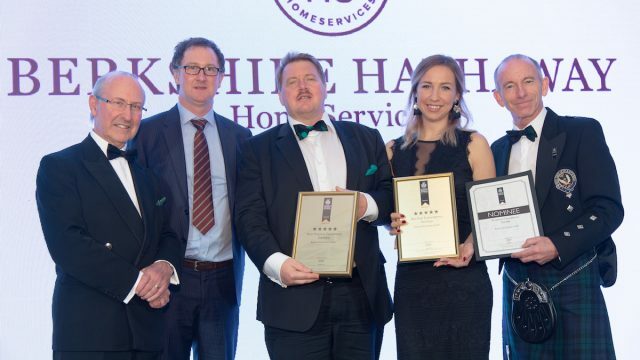 Berkshire Hathaway HomeServices Rubina Real Estate has been honoured several times over the past few years and represented the German capital of the award ceremony in London once again. “Being honoured with such a significant award is anything but routine. We are delighted about the award and are working to be among the award winners in the coming year again”, says Carsten Heinrich, Managing Director of Berkshire Hathaway HomeServices Rubina Real Estate.